When it comes to buying a gift for a newborn baby, nothing could be more perfect than a soft and warm lambswool blanket, which can be passed on from generation to generation, yet still look as beautiful as the day it was brought home. We want babies to feel safe, treasured, warm and protected while they are snugly wrapped up in their natural woollen blanket. Our brand new range of baby blankets are woven from 100% lambswool and brushed carefully with teasel heads, ensuring the softest possible finish against your baby’s delicate skin. Perfect for keeping your baby warm in the winter and cool in the summer. Research reported in the medical journal The Lancet has also found that it has a soothing effect that can result in better sleep and improved weight gain. But not only are these blankets a fabulous practical choice for your baby, they will also look beautiful in your home. Coming in three lovely designs, each one inspired by a different feature of Skye’s stunning coastline, there is the perfect blanket for every family. For those looking for a neutral option for a surprise arrival, our Coral Beach design is a fantastic choice. Inspired by the sands, corals, coloured shells and fragments of dried bladderwrack seaweed, the colours of this blanket range from pure to creamy white and oatmeal, but also include specks of mussel blue, stone grey and the dark brown. This natural coloured blanket is perfect for baby boys and girls alike, and would look stunning in any pram or nursery whatever the current colour scheme. If you want your little one to be assured of sweet dreams, why not rock them to sleep wrapped in our Sea Ripples Baby Blanket. It was inspired by the rippled surface of the sea on a blue sky day on the Isle of Skye. The design is made up from three soft shades of blue in a wavy, undulating weave. It’s a blanket so beautiful that it will undoubtedly transcend babyhood, and be a treasured item for many years to come, perfect for snuggling under on cold winter’s nights and for lying on top of to play games on even the hottest summer days. Perhaps you are looking for purple and pink tones, in which case our Purple Topshell Baby Blanket is your best choice. Inspired by the spiral ridges of pink and purple sea shells (Purple Topshell, Gibbula umbilicalis) commonly found on Skye’s rocky shores, this gorgeous blanket with its mix of pink, purple and creamy white colours would look stunning in any little girl’s nursery. Perfect for those first photographs or for swaddling your baby on the way home from hospital, this is a blanket which will make your baby feel secure during those precious early days. 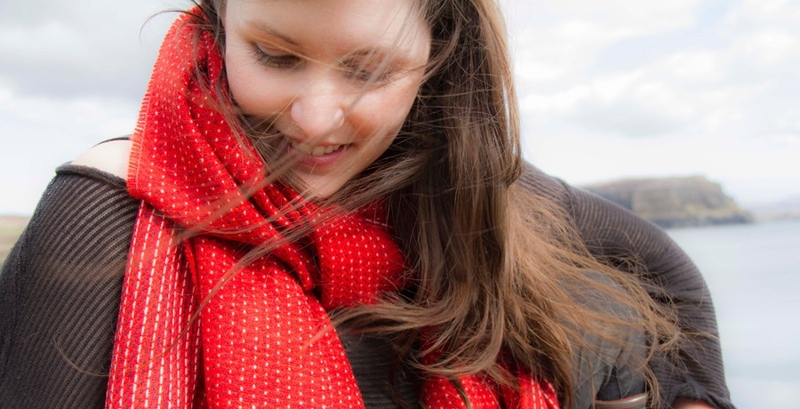 Whichever blanket you choose, you are buying a totally natural and soft product with all the great attributes of wool. And with the help of Eucalan, washing your lovely blanket and keeping it in pristine condition could not be easier. Why not give it a try today and watch how beautifully your baby sleeps within it. Show us the colours of Glendale! The Glenurquhart Check is one of the world’s most famous tweeds. Designed in the mid-19th century it now comes in a huge variety of related patterns, known as Glen Checks. This October – to mark Wool Week, a celebration of all things woollen – we will design our special variation of this pattern, the Glendale Check. But before we can start designing, we need your help. We’re looking for your view of Glendale and its colours. Where are your favourite places in the glen? What are the distinctive colours of Glendale? Get your camera ready and show us. Send us your pictures by the end of September 2016. We’ll compile a shortlist of our favourites. 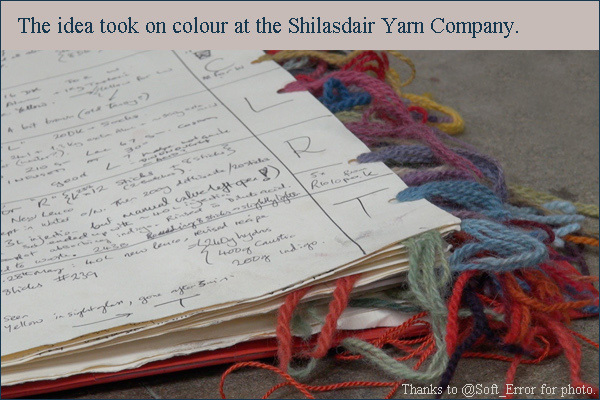 Voting for the winning picture starts at the beginning of Wool Week (10th October). Win four Glendale Check cushions! We’ll use the winning picture as inspiration for our Glendale Check tweed design. If your picture was chosen, you’ll receive a gift of four exclusive Glendale Check cushions. We look forward to seeing your views of Glendale! Here’s our winner! 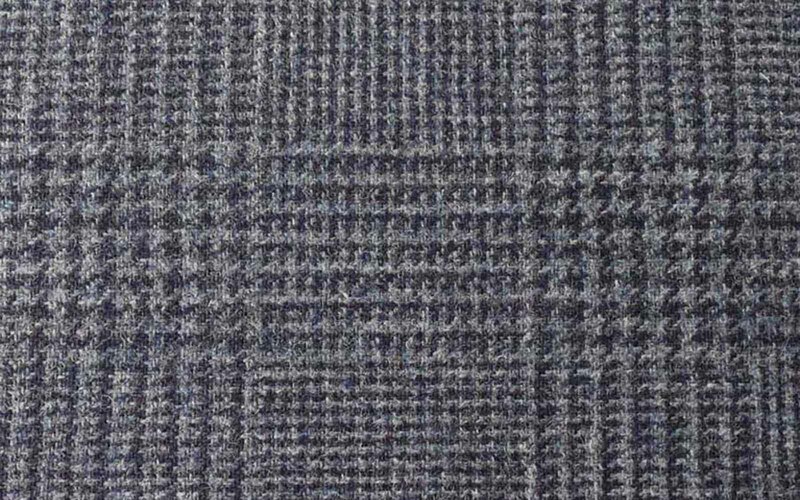 We’re really looking forward to designing this tweed! We love lichens! They are tiny organisms in a multitude of shapes and colours. Most of them like to grow where the air is pure, so we are spoiled with a great abundance of growth forms on Skye. Four of them have inspired our latest range of woollen wraps, woven from soft lambswool. 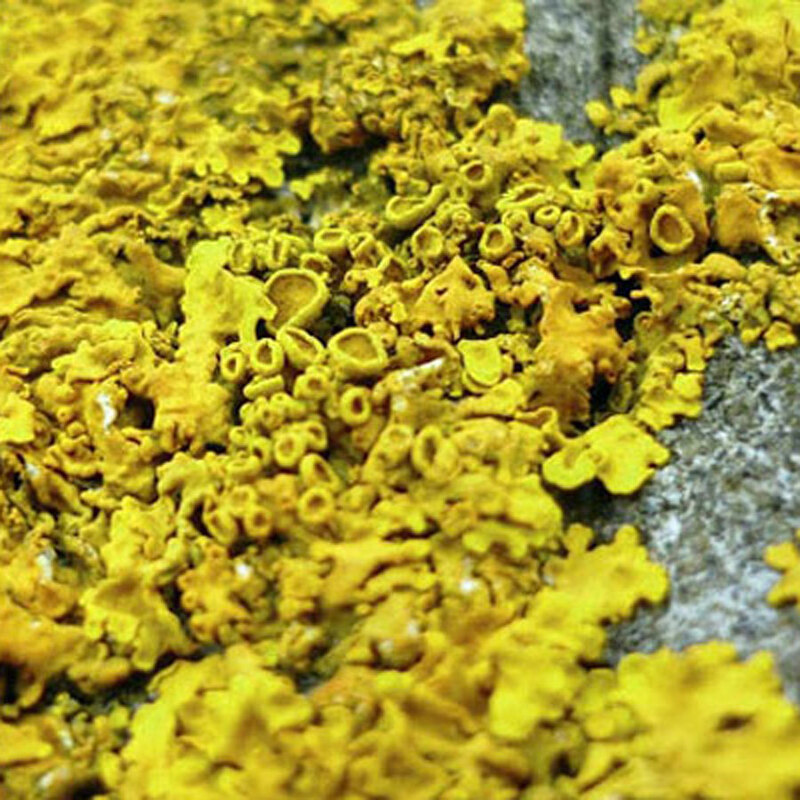 Lichens are composed of two organisms, algea and fungi, which form a stable symbiotic association. Some of them are very slow-growing and commercial harvest is no longer allowed. 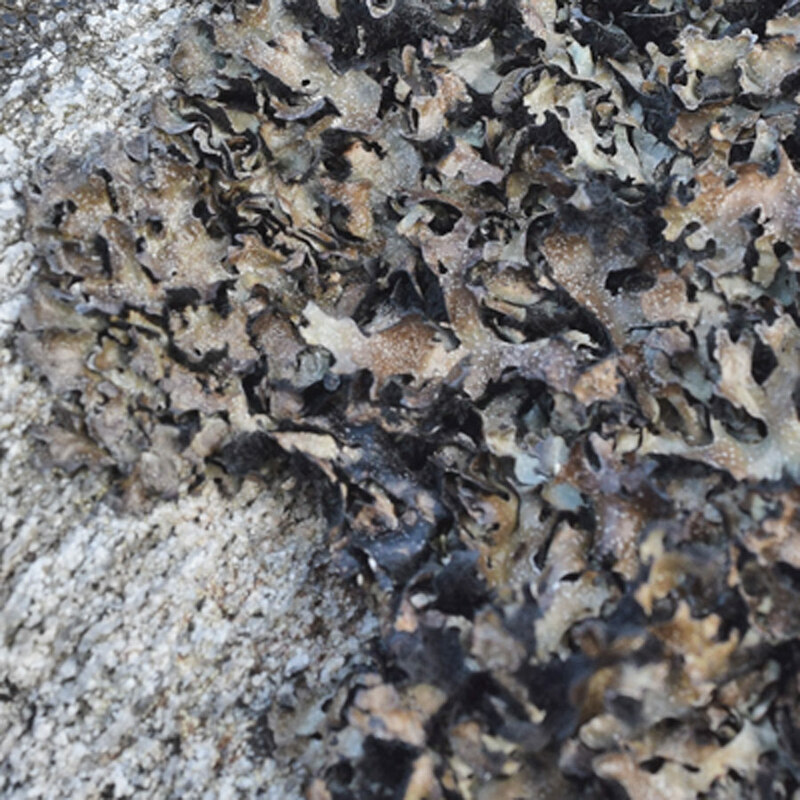 In the past lichens were collected to dye wool for the weaving of tweed, especially Harris Tweed. 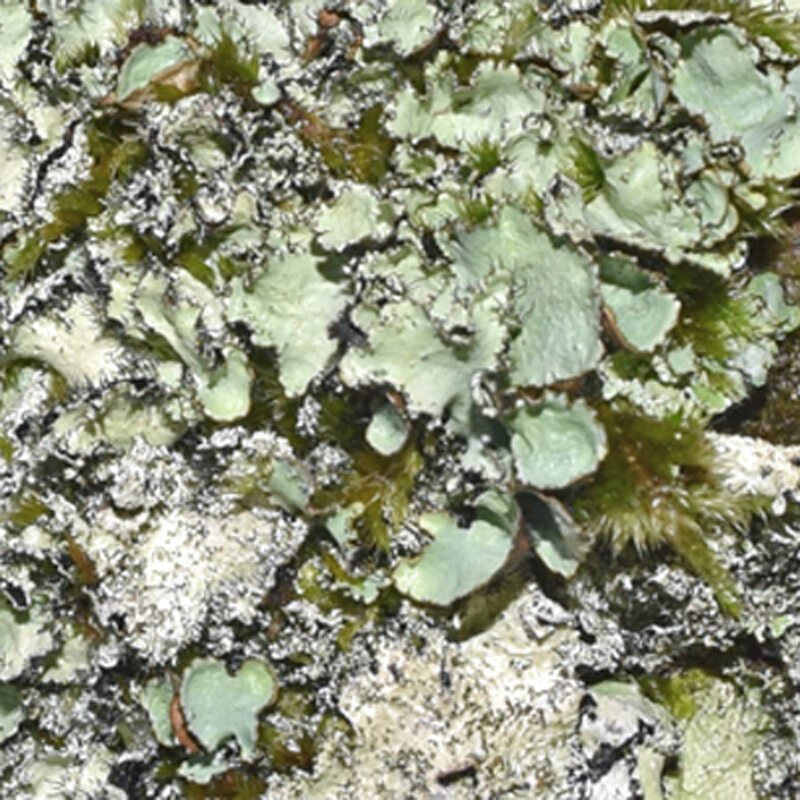 The most famous of these lichens is crottle, which was boiled together with the wool and gave a reddish-brown colour. Another group of lichens was used to make purple ‘orchil’ dyes. To achieve the purple colour the lichens had to be fermented in urine to start with. Even though the dye had a very small light-fastness, it was highly valued as purple was one of the more difficult colours to achieve naturally. We didn’t use lichens to dye our woollen wraps, but we looked at them for inspiration. We chose a two-sided weave design with a soft grey on one side and the lichen colour in a wavy pattern on the other. We wanted to reflect the connection between rock, a favourite lichen habitat, and the living organism. The Isle of Skye is known for its abundance of professional artists and craft-makers. 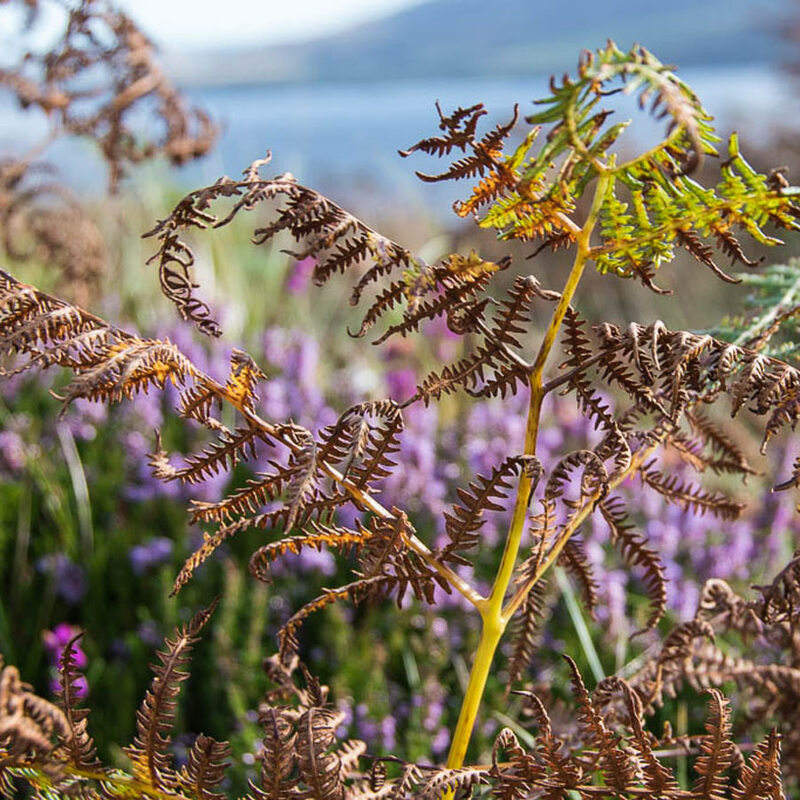 The island’s dramatic coast, stunning landscapes, rich flora and fauna and ever-changing light provide inspiration for both home-grown talent and the many creatives who have moved here to live and work. Now four of the island’s makers and artists have come together in a unique collaboration. 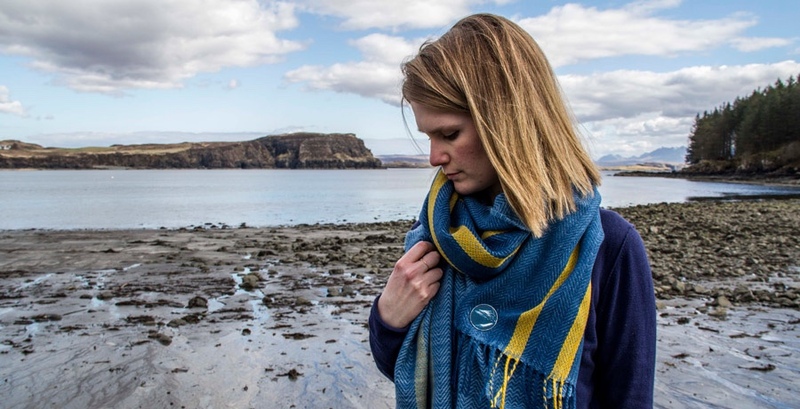 Their collection of naturally dyed shawls, specially designed brooches and original photographs have all been inspired by one of Skye’s smallest inhabitants – the periwinkle. You can buy shawls and brooches online by following the links below, or at the makers’ studios. 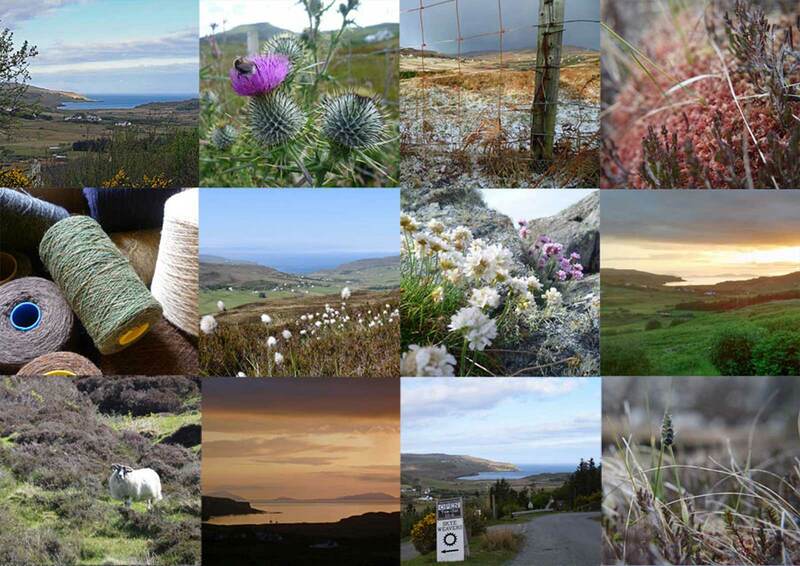 The photographic prints are available at Phil Gorton’s Studio in Roag, Skye. Mounted photographic prints, variety of sizes & prices. Available at Phil Gorton’s studio in Roag on the Isle of Skye. 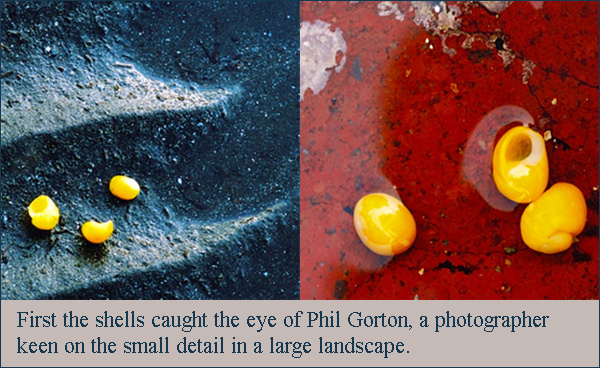 These two photographs by Phil Gorton inspired the design of the Periwinkle Shawls & Brooches. The first image shows the periwinkle shells on the dark, seemingly blue rippled sands of Bharcasaig, one of Skye’s stunning beaches. The second image focuses on the same type of shell lying on the deep red, speckled sandstone, which can be found at the Ard Roag peninsula on Skye. The luxuriously soft ‘Periwinkle Shawls’ come in two colourways. 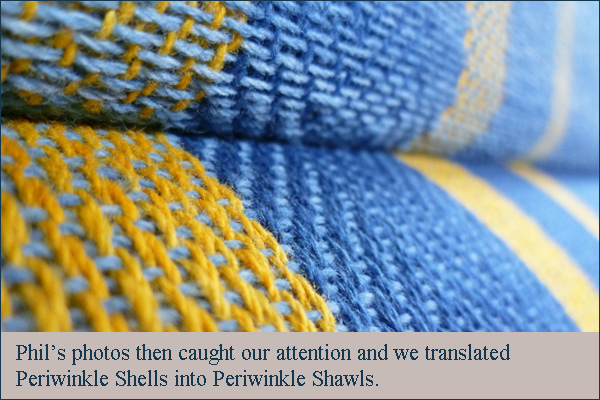 The periwinkles on the rippled blue sand of Bharcasaig find expression in a softly undulating Indigo blue weaving pattern with striking yellow stripes along one edge. The speckled red sandstone appears as a mottled mixture of deep red and specks of Blackberry purple and white. 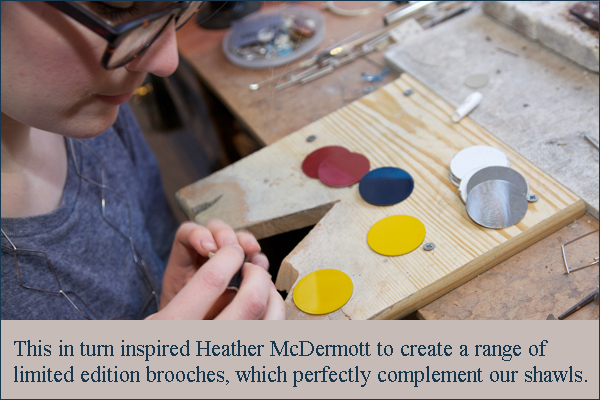 These are Heather’s limited edition brooches using specially chosen colours to go with the woven shawls. Using a periwinkle yellow, midnight blue and sandstone red the pieces perfectly complement the two different shawls. The brooches can be worn with the shawls or as standalone pieces. Made from stainless steel, each brooch is hand finished and distressed, inspired by weathered objects found on the coast lines of Skye. Check out our Periwinkle Pinterest board for more images of the collaboration! Have you ever been to the Isle of Skye? It’s rugged and irregular coastline with small beaches and gigantic cliffs are a constant source of inspiration to us. This blog tells the story of two sets of three yellow sea shells, common flat periwinkles to be more precise. They are the starting point of a very exciting collaboration between four artists and makers working on the Isle of Skye. 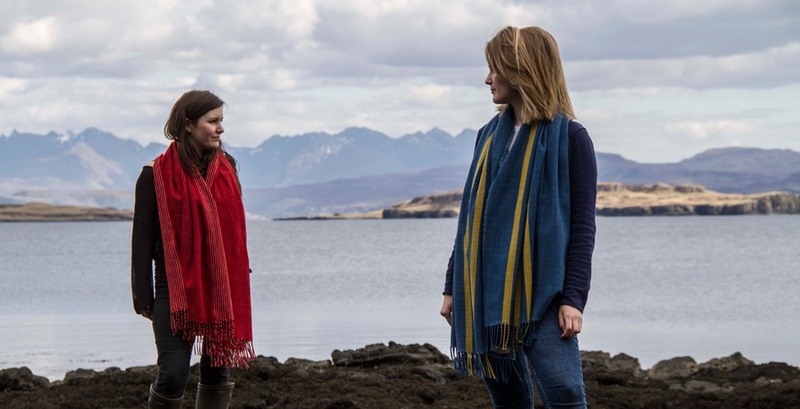 Their collection of naturally dyed shawls, specially designed brooches and original photographs have all been inspired by one of Skye’s smallest inhabitants – the periwinkle. Phil Gorton is a fine art photographer who enjoys exploring the small and beautiful things on the Isle of Skye and other wild places. With his unusual perspectives and close-up photography he manages to capture colourful moments, intriguing shapes and dramatic light effects even on the most grey and monotone days. Skye Weavers are weaving on a bicycle pedal-powered loom in the north of Skye, on the way to Neist Point. 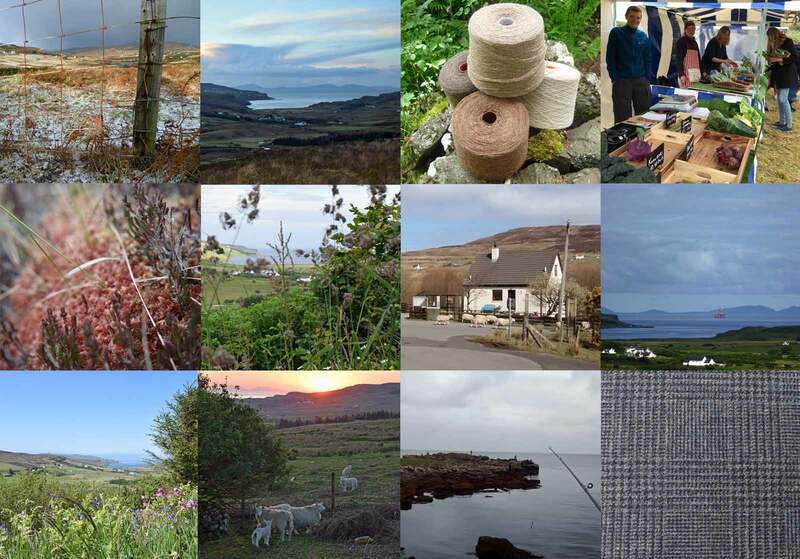 We are always trying to reflect Skye’s landscape in our weaving. Our special interest relates to what Phil is doing in his photography- we love looking at things in close-up! Heather McDermott joined in the latter stages of development. 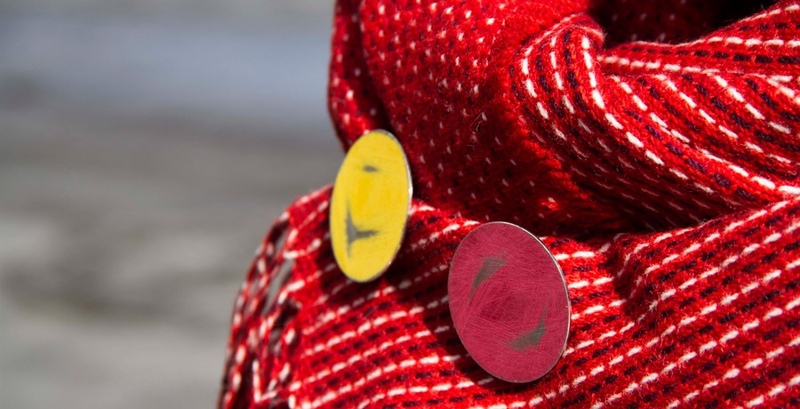 She chose three special colours to apply to her Buoy Brooches that will accompany the shawls. Like Phil and us, she uses her surroundings, especially the shoreline of Skye, to inform her jewellery. The repeated shapes and geometric forms in her jewellery are a statement as well as a reflection of shapes and forms found along the shoreline. SHELLS TO SHAWLS – The finished shawls and brooches as well as copies of Phil Gorton’s photographs will be available to buy in our online shop and on Heather’s website in May. Until then we will be using a Pinterest board to log the development of the collaboration. Images of our workshops, places of inspiration and the processes involved in creating the finished pieces will be released each week. Visit the board here: Periwinkle Shells. Our limited edition Periwinkle Shawls & Brooches will be launched in May. Sign up to our newsletter if you want to be first to know when these special pieces will be available to buy!